I’ve always hated cleaning mushrooms. The folks I enjoy watching on Food Network tell me to clean mushrooms individually with a damp cloth, or to clean them individually with a dry cloth. It is always a royal pain. But Sara Moulton has the solution. Simply toss them about in a bowl of water, rub off the stubborn bits of dirt, and dry them with a paper towel. That’s all. It’s simple and it works. I wrote back in April that after we bought our gas grill we had to decide how we would buy our propane: own the tank and get it refilled or use the swap method. I didn’t even know the first was an option until my brother told me about it. None of our neighbors in Gilroy did that. As I wrote at the time, we decided to buy our own tank. I knew we were saving money in the long haul, but I didn’t stop to calculate how much money we were actually saving. Then the other day I happened to look at the sign on the propane enclosure at Smart & Final, where I go every week, though the sign had never registered with me before. No exchange: $49.99. Tank exchange: $19.99. The first tank we bought was $39.99 at our local mom and pop Trailer Supply store. It was just over $10 to fill the tank given the price of propane at the time. Even money the first time out and $10 ahead of the game every tank refill after that. Recently I bought a second tank. I didn’t want to run out of propane in the middle of fixing dinner – something that has happened to me. I bought it at the national chain Tractor Supply for $29.95 and took it to Trailer Supply to get it filled, where at the then current price of propane it cost me just under $10.00. That’s $10 ahead of the game from the outset, and ten dollars ahead for every refill. Greater savings than I had thought. A pretty good deal. I have long been familiar with George Orwell, having read 1984 and Animal Farm in high school. 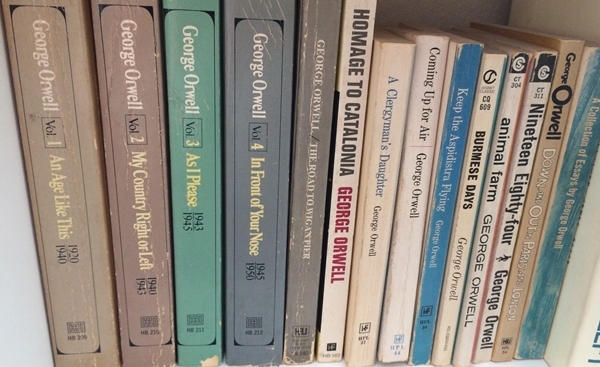 I really became fascinated with Orwell the man and Orwell the essayist when I was a senior in college and wanted to emulate Orwell as master of the essay. In my Claremont days after graduation I purchased Orwell’s Collected Essays. I still have the set. How many people can claim that those volumes sit on their library shelves? More than forty years later my interest in Orwell remains, so when I saw a review of this book I knew it had to be next on my list to read. It was well worth my time. The author ties Churchill and Orwell together by suggesting that while one came from the right and the other from the left, both were fighters for freedom and both believed that individuals were entitled to the truth, unobscured by propaganda. While he follows both men throughout their lives, much of the book focuses on World War II where both were at the height of their careers. Churchill is, of course, a giant in modern Western history. Orwell, on the other hand, was not highly regarded during his lifetime. It was only in later decades that his reputation for foresight grew. Ricks writes about the times sales of 1984 spiked. Apparently the book went to press before the election of last November, as there is no mention of the huge surge in sales of the book after the unexpected outcome. Ricks has a style of writing that is highly engaging and the book moves quickly. More importantly, many of the topics he discusses are more relevant than ever today. I enjoy tuning in to Create TV in the late afternoon (Pacific Time) when it broadcasts a variety of cooking shows. One of the programs that appears regularly is Lidia’s Italy. 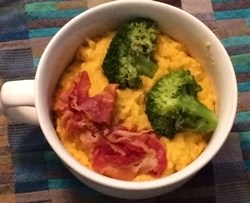 Terry and I were watching one day when she did a polenta dish with broccoli and pancetta. That looked very tasty and easy to make so we tried it on a recent Sunday. Rather than track down Lidia’s recipe for the polenta, I used one that I had on hand from Ina Garten. I have tried it before, and it was very easy and tasty. Ironically, I managed to omit the parmesan from her creamy parmesan polenta, but it still came out very nicely. I also used vegetable broth rather than chicken broth and sour cream rather than creme fraiche, which I have yet to find in these parts. Lidia’s pancetta was thick, looking like bacon that you’d get from the butcher. What I found at Sprouts was paper-thin. It was very tasty, though. One of my favorites. From my friends at First Plymouth Church. And it’s the best version I’ve found on YouTube so far. There are two tracks in Toastmasters. There is the communication track which almost everyone pursues. But there is also the leadership track which is less actively pursued, at least in our club. I had help from our current president and former VP of Education in doing some backfilling, which allowed me to recently receive my Competent Leader award. 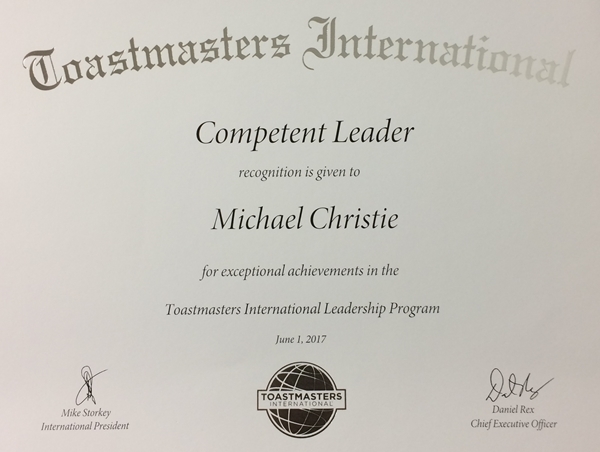 This means I filled a variety of leadership roles, including evaluating, being Toastmaster, running a speech contest, and being a mentor. With my Advanced Communicator Bronze award, in the Toastmaster world I am now Mike Christie, ACB, CL. There is more to do, however. The process continues.